A single specimen was collected in Galapagos in1888, then 100 years later in 1995 by John E. McCosker and Grant Gilmore of the Harbor Branch Oceanography Institution. An endemic species for the islands, S. stilbostigma was re-discovered the spring of 2012 by the NG Endeavour ROV operating regularly at depths of between 250-400 feet. 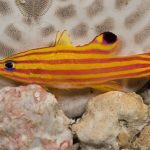 The genus Serranus is a diverse (29 species) group comprised of small basses and familiar to aquarists for the many small and intricately patterned Caribbean species that find their way into our fish tanks, but these aquarium species are only a small representation of the group’s true biodiversity. 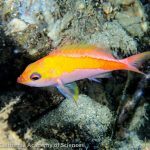 When we descend to a greater depth, down into the “mesophotic zone”, we begin to encounter a great many obscure species of Serranus that rarely get collected. Perhaps the rarest of the bunch is the Side-blotch Serrano, a fish which has only been encountered on a handful of occasions. 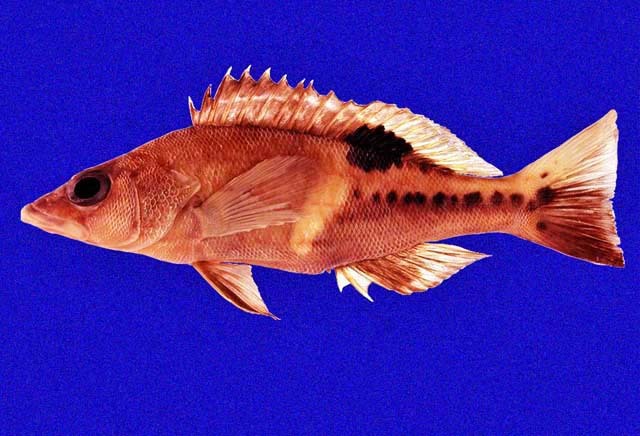 Serranus stilbostigma is a distinctive member of its genus, growing to a robust 6 inches in length and sporting an unusually pointed and elongate body profile. Its color pattern is instantly diagnostic, consisting of a black spot dorsally near the midline and a reflective silver blotch beneath that. This latter marking is alluded to in its scientific name, which derives from the Greek stilbos, meaning “shining”. Other unique features of this fish are its unusually low gill raker count (9 vs. 12+ of most species) and its high lateral line scale count (58 vs. 40-50 in most other species). 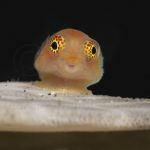 Despite the rarity of observations, this fish has been known since the late 19th century, when the first specimen was hauled up from the depths of the Galapagos Islands. It would remain the only encounter scientists would have with it until it was rediscovered in 1995 by John McCosker (of flasherwrasse fame). More recently, in 2012 a National Geographic expedition utilizing an ROV made the first in situ video recording of this fish (seen above). 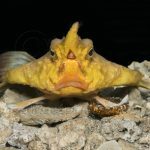 To date, the only observation of this fish outside the Galapagos has been just to the east near Ecuador, with a stated depth range from 80-200 meters along rocky bottoms. https://youtu.be/YnsgRYCj_i4 Serranus is a particularly poorly studied genus, especially when it comes to these deepwater forms, so there are no hypothesis to suggest what, if anything, the Side-blotch Serrano is most closely related to. If it does have a close relative, it’s likely to be found in some of the other deepwater taxa. 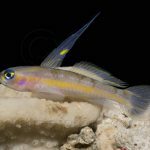 The Tattler (S. phoebe) is an occasional aquarium export which shares certain traits in its appearance with S. stilbostigma, but these may not be indicative of a close relationships, as many Serranus show similar markings to varying extent. The Crosshatch Bass (S. luciopercanus) is similarly elongate and has a relatively high number of lateral line scales, but, again, there are considerable differences elsewhere in morphology and color pattern which raises questions. In all likelihood, S. stilbostigma will eventually be found to have a wide range in the Eastern Pacific, but, until more effort is made in the region to explore the mesophotic depths, it is unlikely we will ever see this handsome fish available to aquarists.